This article was first published in 1998. 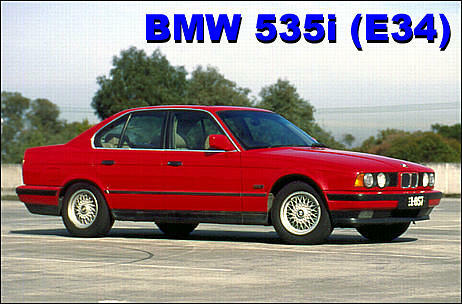 First released in May 1989, the all-new E34 5-series was praised for its handsome shape which retained much of the style and sophistication of the top-line 7-series but with less bulk and a more sporty appeal. It re-introduced mid-size performance to the BMW line up and was certainly a progression from the lazy-revving ETA engines of the late '70s-early '80s. The basic body styling still looks good today. 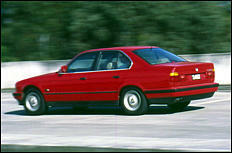 Prior to the release of the M5 and the 540i, the 535i was the gun mid-sizer. Weighing just over 1500kg (3300lb), the car's handling is surprisingly nimble and is exceptionally well balanced. In a straight line, the fiver can accelerate to 100km/h (62mph) in around 8 seconds in manual form or 9.1 seconds with the optional auto. Top speeds average 230km/h (145mph). Quarter mile times range from 15.7 seconds (manual) to 16.5 seconds (auto). The relatively quick and heavy car does have a thirst for fuel though, consuming 11-16 L/100km (18-26mpg). One rarely sees the needle on the dash-mounted real time fuel consumption gauge swinging down amongst the small numbers! Displacing 3.43 litres (not the expected 3.5), the alloy head cast iron block runs a compression ratio of 9.0:1 and uses a single camshaft and 2 valves per cylinder. 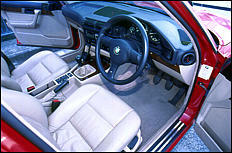 A Bosch Motronic engine management system with an old-technology vane airflow meter is used - as in all BMWs of this era. Despite the lack of twin cams and multi-valves, the engine can still produce 155kW (208hp) at 5700rpm and 305Nm (225ft-lb) of torque at 4000rpm. A 5-speed Getrag manual gearbox or a 4-speed ZF auto can be found in the transmission tunnel, with the manual 'box's throw a little too long for our liking. Driving the car reveals the engine's beautifully smooth progression, with ample throttle response and a willing eagerness to approach the 6200rpm redline. It's the sort of engine you can toddle around with and wonder which of a couple of gears to select - such is its drivability. The rear suspension system incorporates anti-squat geometry. It uses traditional BMW semi-trailing arms and coil-over struts with an anti-roll bar. The front uses MacPherson struts, lower lateral links, an anti-roll bar and anti-dive geometry. 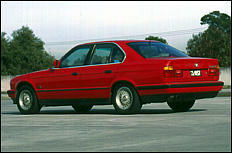 The 535i gained more ride control over lesser models with the inclusion of separate spring and shock absorber mounts. Speaking of oversteer, there is also a rare 535is model available with all the same specs as the 535i, except with some extra icing courtesy of a limited slip diff and rear spoiler. Braking performance is good to excellent, achieved under the control of a 3 channel Bosch ABS system acting on 302mm (11.9 inch) vented discs at the front and 300mm (11.8 inch) solid discs on the rear. As a guide, the car can pull to a stop from 96km/h (60mph) in 39.3metres (129 feet). Lace-style fifteen inch forged alloy wheels wearing substantial 225/60 tyres are standard fare for the 535i. The body features flush-fitting windows, raked glass, smooth underbelly and carefully defined front and rear spoilers to achieve a drag co-efficient (Cd) of 0.32 with optimum downforce. Being in standard form a quiet, refined vehicle, we'd suggest the exhaust and air intake systems would be quite restrictive in the name of reduced noise. This means the standard exhaust could be replaced with a larger diameter high flowing system equipped with the necessary cat converter to remain emissions legal. An increase in power of up to 10% could be expected if combined with a quality set of headers. A high flow air filter (ie K&N etc) and cold air induction system will also yield an increase in power of about 5%. Depending on your intent, everything up to turbocharger kits are available to stomp out an impressive 260hp. 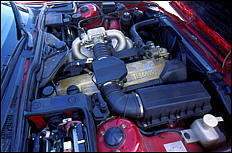 Such kits are available through companies such as Mosselman Turbo Systems for around A$8,500 installed. Alternatively, high compression pistons could be fitted along with a bigger cam and head porting. This can achieve 280hp, but you'll also have to invest in a programmable engine management system (such as MoTeC) and a set of larger injectors - total cost in excess of A$8,000. There are no common ailments with the 535i that we've managed to source, but it is recommended that potential buyers steer towards vehicles with BMW dealer service records and low mileage. Having said that, we've driven one example with around 200,000km on it and would hardly have though it had travelled over 100,000! Being a prestige car, all maintenance and repair parts are fairly expensive but the general reliability of the entire package shouldn't pose a problem for normal drivers. 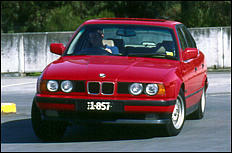 Released in late 1989, the 535i ran through to 1993, with the only running change being the inclusion of a driver's air bag as standard from 1992. In Australia, an average example can be bought for around A$28,000, while an immaculate one-owner vehicle costs closer to A$34,000. For those interested in the very similar 535is model, add another A$2,000 to the base price. This is remarkable value considering the car retailed for approximately A$90,000 when new! The 535i delivers enough luxury, prestige and performance to keep anyone with a family very satisfied. A generous boot area, practical storage facilities, combined with a wide path into and out of the cabin means it's great for family outings. On the other side, there's enough power and chassis engineering to make it a pleasurable driving experience for those wanting to let loose occasionally. Excellent brakes and suspension, plus good visibility and powerful ellipsoid headlights combine to make it also a very safe vehicle. The car also offers many small niceties such as auto-dipping rear view mirror and separate left and right climate controls. An excellent combination of comfortable ride, handling, performance and practicality. Now available quite cheaply, the 535i offers a level of design and comfort not completely removed from the current model 5-series. In this 'image' segment of the market place, the current model is always an essential item for the upper class, meaning the superseded models offer excellent value for money for those in the used market. Thanks to Wayne Besanko of Powerchip for access to the car.